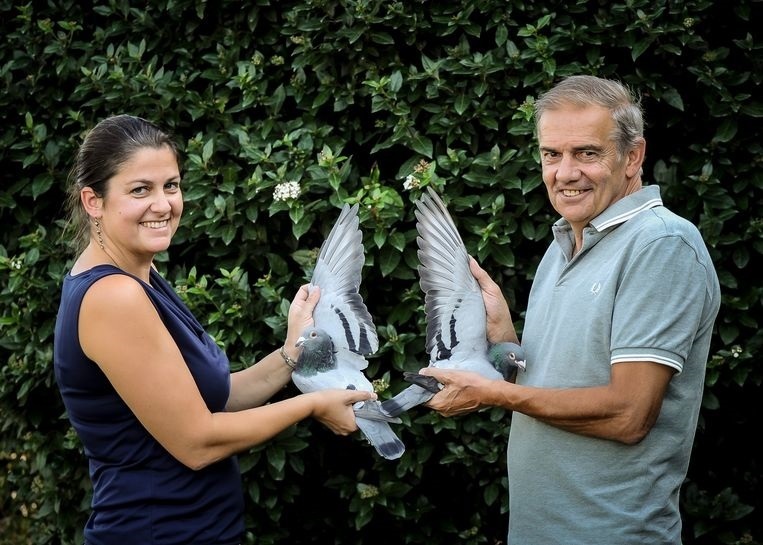 It is difficult to grasp that this event marks the end of Gaby Vandenabeele’s pigeon racing career. The last ever pigeons bred by Gaby were sold on Monday. A total of 815 pigeons were sold in auction: 534 young birds and 281 old birds. The most expensive young bird was sold on Monday: a wonderful son of Rudy x Miss Overegge went to a Chinese fancier for 71,000 euro, making him the most expensive young bird ever in an online auction. The second most expensive young bird is a full brother of the previous one. He was also sold to a Chinese fancier, with a winning bid of 51,000 euros. The most expensive old bird in this auction was of course New Bliksem. He was sold for no less than 376,000 euro, making him the most expensive bird ever to be sold in an online auction. The new owner is Xing Wei (Kaier) one of China’s most well-known fanciers. The second most expensive bird was 12 year old stock breeder Rudy, which raised 166,000 euros. The 815 pigeons will be moving to 30 different countries, which is testament to the international appeal of the Gaby Vandenabeele breed. We also have a new number one in the list of most expensive birds ever sold in auction: New Bliksem.